Often referred to as “cyclone fence”, chain link fencing is one of the most popular types of fencing available and is offered in galvanized metal or vinyl coated. Due to its popularity, chain link fence costs are relatively low when compared to other fencing options, though this does vary by situation and requirements. The “open wave” design makes it easy to see through chain link fence and is a top choice when it comes to sports applications such as tennis courts and ball parks. We carry chain link fencing for all types of residential, commercial and security needs. Every chain link fence is a combination of many components, and a short cut or inferior item on any of the components could adversely affect the entire fence. Rustic Fence uses only material that is designed to hold up under the extremes of the Mid-Atlantic region weather. We provide all different types of vinyl coated chain link fence solutions and can custom tailor our product to fit specialized needs. 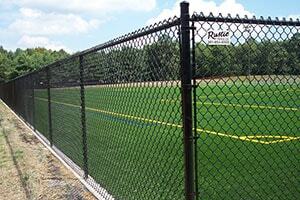 Rustic Fence’s chain link fencing is available in standard galvanized (silver), black or green vinyl. Added options include bottom rail (ideal for dogs), bottom tension wire, privacy slats, self closing gate hardware (ideal for pool applications) and different diamond mesh sizes. Standard mesh, or 2″ mesh, is ideal for most applications. 1 3/4″ mesh is mainly meant for tennis courts. 1 1/4″ mesh is specified in most cities and towns for pool enclosures. We can customize the finish on the fence, which results in different gauges (thickness) of the fence depending on needs. All vinyl chain link fencing comes with a galvanized coat on the wire core for increased durability. Please review our chain link photo gallery and be sure to call us today for a complimentary estimate by one of our trained staff. 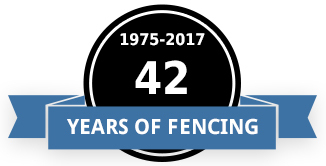 In addition to our extensive experience with chain link fencing, we also can handle your every fence need from farm and ranch to athletic facilities to office buildings to residential needs. Don’t take our word for it! Check out our customer testimonials page to hear what our customers have to say and call us today for a free estimate 301-854-6500.